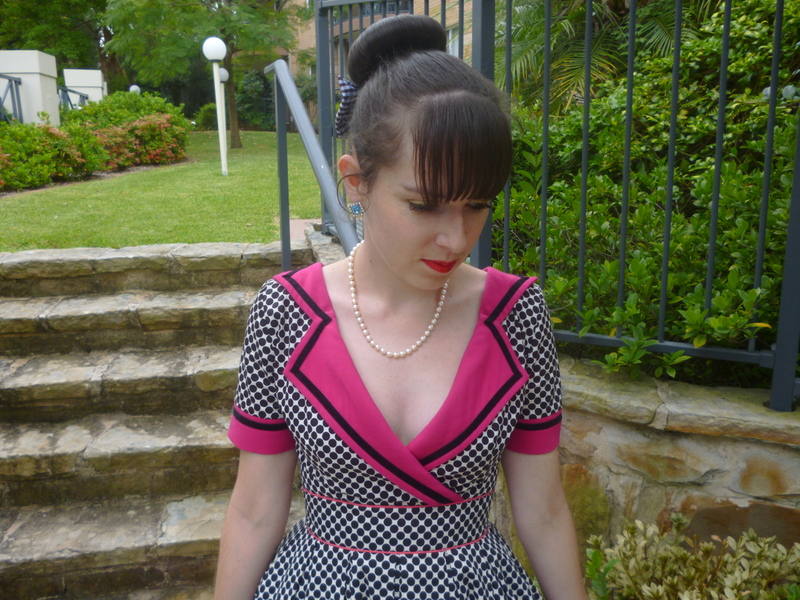 Here it is- The Dolly Darling Collar Dress! This is my dream dress; out of all the many dresses I’ve ever owned this one is my absolute favourite. 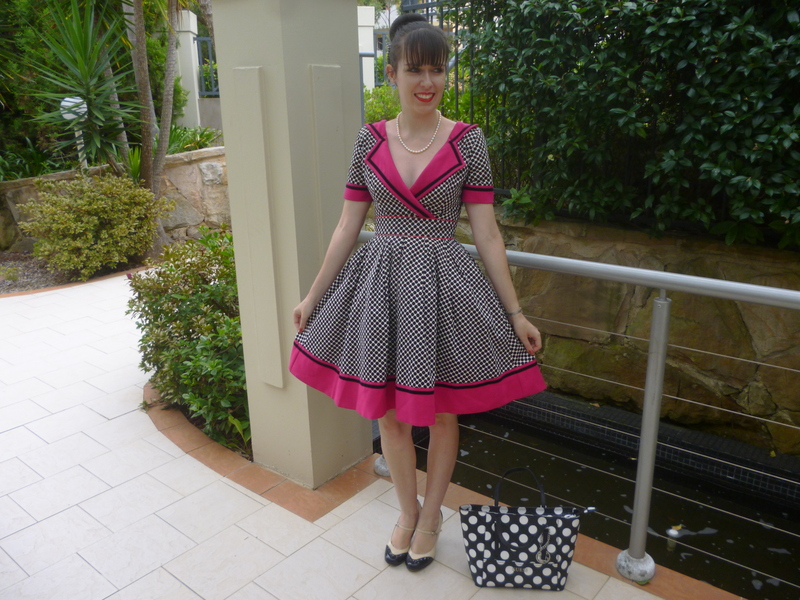 As I mentioned in my last post I’ve wanted this dress for so many months; Kitten D’Amour wasn’t in Sydney when this dress was originally released so I didn’t know about it until it had already sold out. 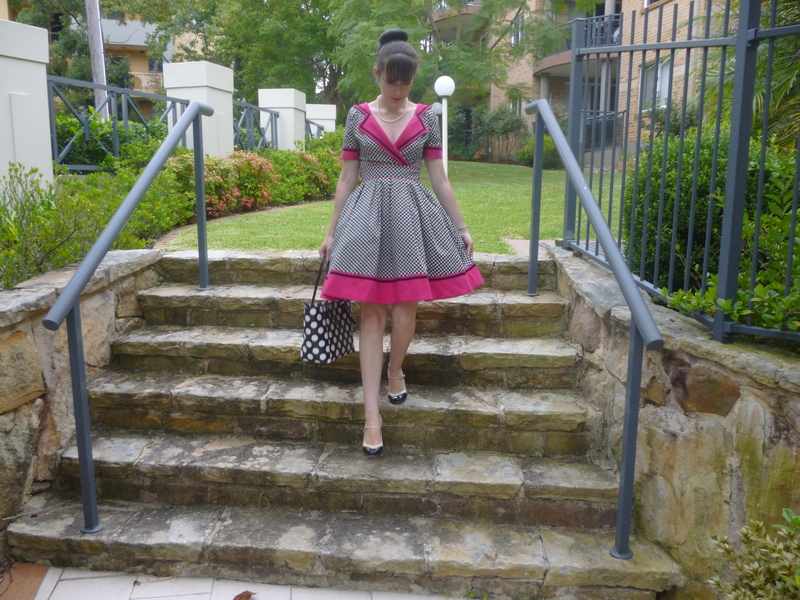 I was so lucky to find someone, on the Kitten D’Amour Buy, Swap and Sell Facebook page, who was willing to sell it to me; I couldn’t believe I was able to secure the dress given that everything sells so fast on the site. It’s even more gorgeous in person and was everything I expected. 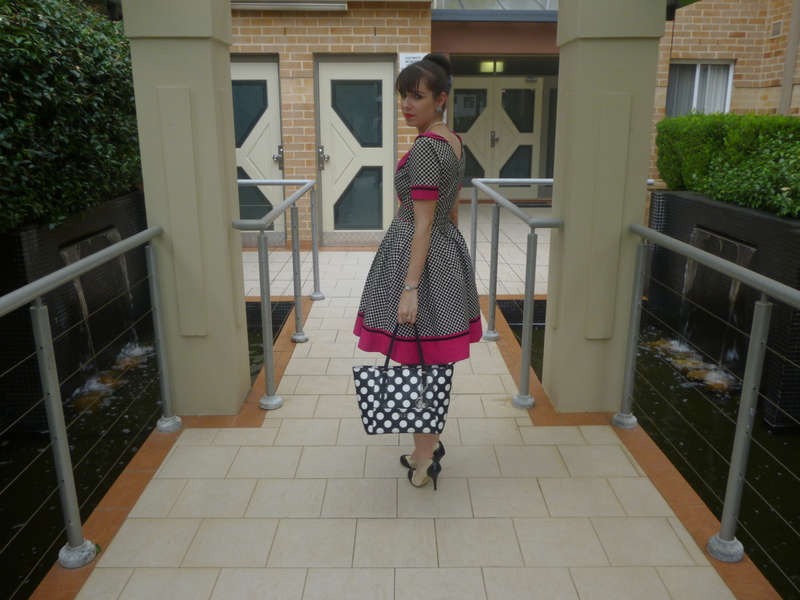 It fits perfectly, is excellent quality and has layers of netting underneath to provide the 1950s silhouette. 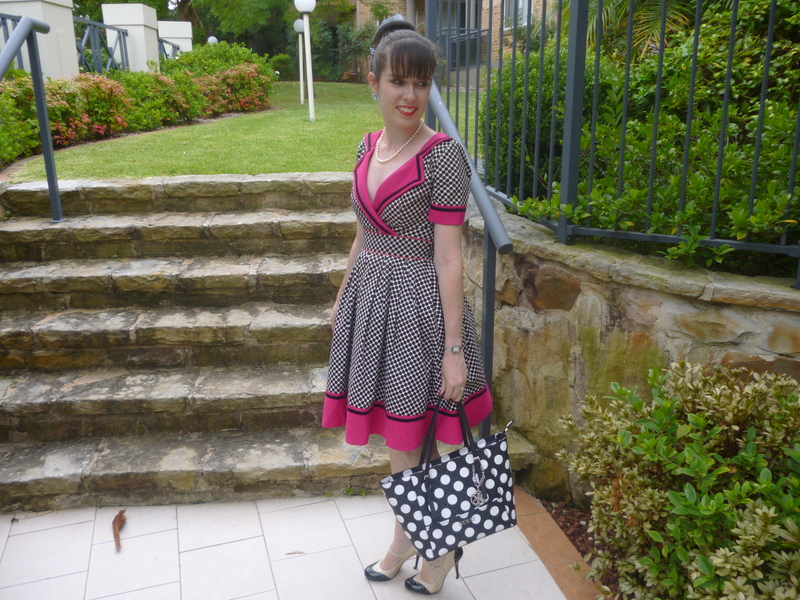 The print completely reflects my style; the combination of hot pink and polka dots is absolutely stunning. I definitely think pink is the best colour for the detailing; but it would also be amazing if this dress came in other bright colours such as yellow! In a couple of days the much anticipated Yasmin collection from Kitten D’Amour will be arriving in stores and online. I’ve seen so many pictures of it from the previews and have never looked forward to the arrival of a collection as much as this before. I even put money aside for it when I knew I was going to be starting a spending ban soon. In other news, a few people have asked if I could provide an update on my work. Since it consumes most of my life, that seems fitting. Sometimes it is the best place in the world and at other times it is the worst. One week I’ll have extreme motivation and want to work on the weekends but other times I can hardly bring myself to do anything. Those days of zero motivation are largely a result of my other issues such as being depressed, feeling anxiety on public transport and struggling to get a proper night’s sleep. The routine can get very mundane of course, I often wish I was doing something more exciting than working five days of every week. But I quickly realise that I don’t actually have anything better to do and I’d be much worse off without work anyway. Being unemployed, even for a short term, was incredibly depressing and I hated every second of being a university student. If you have to live in the real world then work is definitely the way to go. The work I do is not exactly hard and I like that. I’ve never been one who is particularly ambitious or out for a challenge so I like the familiarity and I feel proud that I’ve come to know a job so well. Even with it not being hard, I still never thought I’d be able to handle any form of full time job so the achievement I feel from that has been immense. I feel like I fit in there more than any of place over the course of my life. I don’t have any friends outside of work and the lack of social life makes me lonely. My work has successfully filled part of that void for quite some time now. I’ve tried to involve myself in much more than I normally would have and it has paid off. As much as I dislike work sometimes, and the whole routine is a lot of effort, it is the best thing that’s ever happened to me and I try to remind myself of that. That sums up my experience of the last year and a half; if there are any specific questions you’d like answered then please let me know. 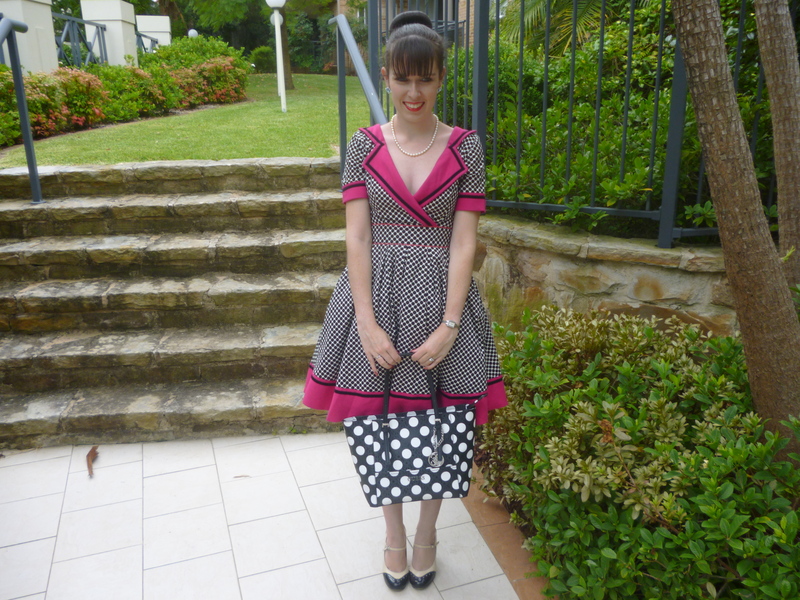 This entry was posted in Guess, Kitten D'Amour, Outfits, Wittner. Bookmark the permalink. You look adorable, as always. What a pretty dress! Such a romantic and beautiful dress. You look lovely by dear. Love the color and polka dot pattern of that dress. Just lovely!! love the fit, n the vintage print on u. That dress is too cute!!!! That dress is so you. I love all the dots in your outfit. Great look love! Thanks for stopping by my page. That dress is gorgeous, unique and absolutely stunning on you! I'm in love with this dress! It has such a fun retro vibe and you pull it off perfectly 🙂 Thanks for sharing! What a beautiful outfit! Lovely! This is one of those perfect dresses for sure. I love it! Love the collar detail on this dress! You are the Queen of Adorable Dresses. Omg. <3 The colors and print of the dress are perfect. Beautiful neckline. Love that bag! Looking pretty in that dress! You look just like a doll ! Adorable on you, and so vintage looking! Such a pretty dress! Love it and love your bag too! I'm really happy for you, it sounds like your job is really well suited for you. I think even without anxiety and depression, there are times when work gets annoying and demotivating, and it's great that despite these periods, you still keep a positive outlook on things! Your outfit is cute, retro and elegant!